- Bug Fix with some users that encounter freeze. There's a special subset of the current adult population that grew up on brainteasers as kids - you know, the ones in cheap flipbooks printed on that vaguely gray paper, progressing from dead easy to über difficult, followed by answer keys in the back. Sompom Games' Origin Brainsquare will appeal directly to these folks; it's a puzzler revolving around a simple mechanic that you've got to exploit with greater finesse as you climb through the levels. The aim is to connect the similarly colored dots through adjacent similarly colored squares. Don't worry if that sounds a bit convoluted - the app walks you through a step-by-step tutorial to get you off on the right foot. Send blocks flying in one direction or another to line them up correctly within the maximum number of moves, which is incredibly easy in the first several levels, sloooowly ramping up to seriously fiendish configurations of blocks requiring multiple moves and plenty of forethought. I love the game mechanic here; it's just different enough from others I've seen to be seriously addicting. The one issue is the presence of ads - you're forced to watch seconds of video ads here and there, which is annoying enough to put me off of the app somewhat (I see other user comments to this effect as well). It doesn't interrupt gameplay, though, and you can purchase an ad-free version of the game through the Settings menu. 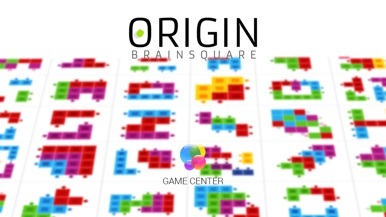 Sompom Games' Origin Brainsquare is slick puzzling fun to get you scratching your noggin. Origin will tackle your brain in a different way than Brainsquare. Rules are the same, link all pins of the same colors with their corresponding square tiles to solve each board. 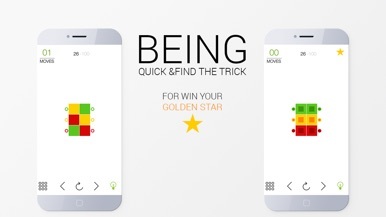 Logic and ability to see forward is still required to complete the level. And you get all the levels for FREE. Complete the levels in the number of moves allowed for each level, and share them on Facebook, especially if you manage to beat the minimum moves allowed.